With Voice Match, get your calendar, commute, reminders and more right on the home screen. You can even get the news, make a shopping list, and place calls to friends, family and local businesses. "Hey Google, show me my calendar." Voice-control compatible lights, cameras, TVs and more from a single dashboard. 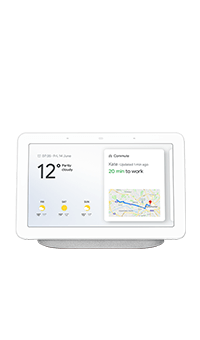 Works with Nest and 200+ smart devices from 50+ popular brands. "Hey Google, show me the front door camera." Ask questions and get visual, immersive answers from Google on weather, recipes, local business info, and more. You can even watch helpful videos from YouTube. "Hey Google, show me how to tie a tie." Use your voice to play your favourite songs, albums, artists, and music videos from YouTube Music. You can also listen to Spotify and your favourite radio stations. "Hey Google, play some jazz music." Use your voice to show your pictures in Google Photos. And, see your favourite albums even when your display is not in use. "Hey Google, show me my photos from Cornwall."